He longs for us to praise Him. Spanish scripture taken from la bibilia de las americas. A partial repost from past files--you'll understand why toward the end. 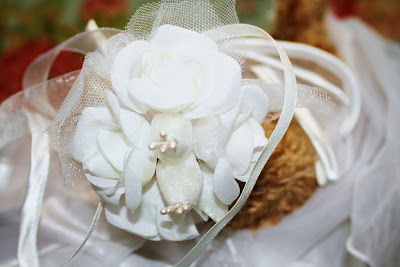 The bride wore a finger-tip paw claw-illusion veil secured by three delicate white roses. She carried a bouquet of four white roses and seed pearls. Attached to the bouquet were streamers of white satin. 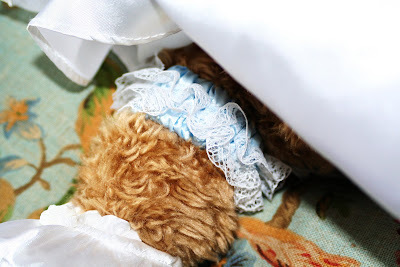 At one point she did give us a peek of her "something old, something new, something borrowed, something blue" garter that was concealed beneath her lavish gown. 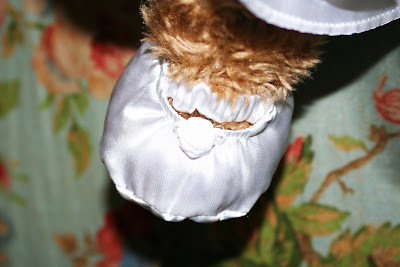 The bride chose to wear satin ballet slippers adorned by one tiny rose and secured by an elasticized band--the better for dancing at the Teddy Bear's Picnic and Reception immediately following the ceremony. And here she is in all her glory wearing a gown designed by Beara Wang. The gown featured an alencon bodice accentuated by cap sleeves trimmed in white satin. The dress was gathered in at the waist with a bow featuring roses and seed pearls. Cascading from the bow was an over-lay panel of illusion trimmed also in white satin. The bride and groom will spend their "honey" moon at Grizzily Island in California. NO EXTRA CHARGE FOR THIS LITTLE SIDE NOTE: When I was preparing the original part of this post--a year or so ago, two of my granddaughters were here. I read them the book about the Teddy Bear's Picnic and showed them this little YouTube video. While we were on YouTube we discovered another teddy bear's picnic starring Jade and her grandfather. It is so cute. Now every time my granddaughters come to visit, we sit and watch it umpteen times. If you have little girls I think they will love it. Here is the link. Okay, I am just having a little fun--tomorrow is a special day for my husband and me--our 45th wedding anniversary and since we were married on a Saturday and this anniversary falls on a Saturday, it makes it that much more special. Here is the real dress. It really kinda looks like the one above, doesn't it? LOL This was my aunt's dress and I loved it. She is 5 months younger than I and was getting married about 5 months before me so she and I picked out the dress together. Of course, she paid for it. It cost $75 in 1965. I suppose that was a fortune then. My flowers for the wedding topped out at $48. My dad got the invitations free. My maid of honor, Mom and I washed 200 plates, cups and saucers the day of the wedding. I borrowed those and the punch bowl from the university I attended. I think my going-away dress was about $8.00. So I spent somewhere in the neighborhood of between $50 and $75 for my wedding. Many of you know I attended a calligraphy and art workshop in Santa Fe, NM a few weeks ago taught by one of my favorite calligraphers and artist, Randall Hasson. In fact, Randall gave me permission to use one of his renderings in this post so a great big thank you to him. By the way, if you want to view some of the most incredible contemplative paintings you've ever seen, please click here for a link. I have loved calligraphy for years and really went to Randall's workshop to learn some of his techniques for applying paint to canvas. I came away very inspired but something happened that I really had not planned on. Because he adds life to his paintings with people, I found myself wanting to paint people, portraits in particular upon returning home. But how to go about this? I had painted one portrait (tried is the operative word here) and sketched one bust of JFK when I was a teenager. So you get the drift, this is NOT something I do. I reviewed what knowledge I had about getting better at something. 1. Wanna play piano--take lessons, practice piano. 2. Wanna be good at football--learn the game, practice every day. 3. Wanna paint portraits--practice painting portraits. So I set out with determination at the start of last week to choose a painting, to paint it every day until I noticed a likeness, choose another painting, start again. So I chose one of Randall's paintings of a man in deep, painful thought. And I painted and I worked so hard. Yes, after many attempts and working and working and reworking, taking color out, putting color back in, etc., I noticed an improvement and yes, maybe someday I really will be able to paint portraits if I work hard enough. But when I put it up beside the real thing (Randall's painting on the left), I see just how far short mine falls. Oh, I like it, I really do and I think it is almost good--but a sound critique from me would notice that Randall's looks like a real man, not like a painting--mine definitely looks like I tried to paint a man's face. All that to say this--all week long as I was doing this, I kept thinking about how much time do I spend trying to grow in Christ's likeness. Am I determined to be like Him? Would anyone mistake my actions for His? Am I changing some each day to look more and more like Him? This prospect of growing to be like Him can be a little overwhelming when we consider our sinful ways. However, there is good news--God promised that He would finish what He started in us. We can trust Him with this, we know that--but it stands to reason that the more we comply with His teachings, the more time we practice His presence, loving Him, treasuring His Word and truly glorying in His company, the more rich this journey will become and the more we will start to resemble Him. He longs for us to imitate Him so that we can reach out to a lost and dying world and they will know, in us, they have seen the face of God. A couple of years ago, my husband and I took some of our granddaughters to Build-A-Bear. While watching them get such joy out of custom dressing their dolls, memories from the past started flooding my mind. Memories of scant Christmases as far as presents, especially baby dolls, were concerned. For a few Christmases, bride dolls were the rage during the '50's. 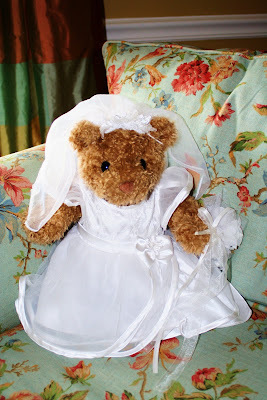 Since the only real dreams I ever had consisted of growing up, getting married and having children, I wanted a bride doll more than I have words to express. 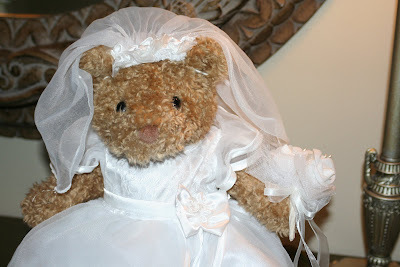 Needless to say under our financial conditions, a bride doll was never in the realm of possibility. All of my friends and relatives eventually got one and yes, I had a major pity party for some years over that. As I was sitting there in Build-A-Bear thinking all these thoughts and how blessed my grandchildren are and don't even realize it, my husband came over and asked me what was on my mind. I think a few tears began to flow as I related as quickly and briefly as possible what I was thinking. He insisted that I build-a-bear. 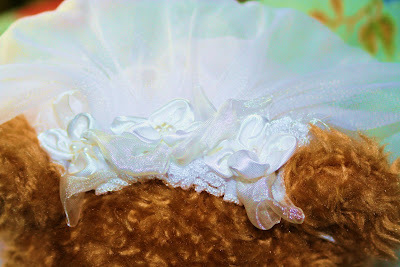 So the precious little bear above is my bride doll--some 50 years late. What didn't come late for me though was my precious bridegroom, Jesus. As a little girl, I was introduced to Him and He has fulfilled every dream that I ever had and more. When asked to teach a Bible study lesson some years ago, I decided to write a lesson on BEHOLD YOUR BRIDEGROOM COMETH! Remember when you fell in love for the first time. You couldn't spend enough time with that person, you couldn't talk to them enough--and when you weren't with them or talking to them, you were writing love letters. Remember how intently you listened to one another? Thinking of this and how much importance God places on the written word in the Bible, I asked the ladies to write a love letter to Jesus. We took some time to write these and then we shared what we had written. At the end of the evening, one of our young ladies donned her wedding gown and came into the room and handed each of us a new name--among them were Mrs. Lion of Judah, Mrs. 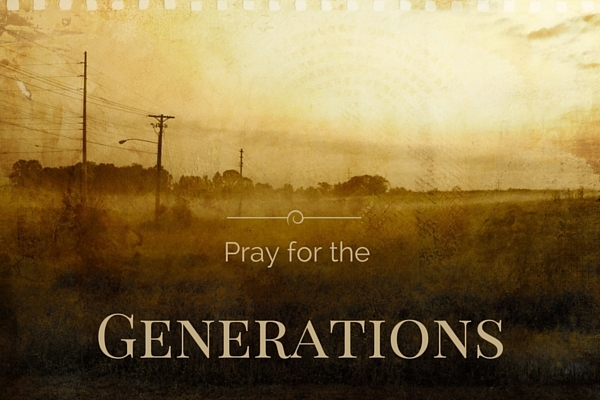 Ancient of Days, Mrs. Immanuel, Mrs. Jehovah Jireh, Mrs. Bright and Morning Star, Mrs. Jehovah Shalom, Mrs. Alpha and Omega--and on and on the list could go. Keep my commands and you will live; guard my teachings as the apple of your eye. Bind them on your fingers; write them on the tablet of your heart. Speaking of bridegrooms and love letters, isn't it interesting that we are promised a white stone and a new name--things you get when you become a bride. As I ponder the assignment for this Walk With Him Wednesday concerning listening to God, I have to stop and ask myself, "What is written on the tablet of my heart, what is written on my doorframes, what do I talk about when I sit down, when I walk along the road, when I lie down and when I get up? What has been written on the tablet of my heart? What spirit am I listening to? Am I listening to my bridegroom telling me to build-a-life on Him and His promises or am I listening to the enemy of my soul? I want the tablet of my heart to reflect His mercy, grace, love, and compassion. I want to hear and see Him clearly. THE VEIL HAS BEEN REMOVED--SHE SEES HIM CLEARLY! He longs to give us a white stone and a new name. Photos: The crepe myrtle trees in our cul-de-sac are just beautiful this year--loaded with blossoms. I took these pictures this morning with a p & s camera. When was the last time you judged something or someone and found out you were wrong? Anytime I am guilty of this, it is too often. Recently (around the 4th of July) my husband and I were driving out to my sister's house which is about a thirty or forty minute drive from the city. We passed a house that I have driven by many times before and had really never noticed. Since I was in the market for "Americana" pictures, I noticed this small, white-framed house with an American flag. It took my eye--it was so simple--and the flag just seemed to jump out at me. I asked my husband to stop so I could take a picture. He stopped and I hopped out of the car and took the first picture. I remember thinking something like, "Oh, this precious little house where some precious people live--I know they care about their place--it is nice and neat--they are proud and patriotic with the flag and all." And my mind continued, "But, only a few small bushes on the side--I wish they had some more landscaping--it really would add to their little house and it would give them something beautiful to look at down here in the flatlands of Arkansas where soybeans and rice farms are in abundance. These silos were right across the road from the house. Then I walked several feet to my left to get another angle of the house and I thought I caught a peek of something. some of the most beautiful, natural landscaping I've ever seen--God's cypress swamps! This is only fifty feet or so behind the little house, but it is not visible from the road. Boy, had I ever misjudged what they get to view each day. It made me stop and think of how many times we misjudge situations or people in our lives. We might be shocked to know what lies just below the surface or a little beyond our present view. This week, Lord, give us eyes to see beneath the surface--to search a little deeper each person and situation we come in contact with, knowing it is You who supplies the real treasures, you who cultivates the landscaping of our souls to make them beautiful for someone else to behold. Lord, forgive us all the times we have passed a cypress swamp never knowing it was just steps away and give us Your wisdom and Your understanding so that we may recognize the true gifts when we do see them. He longs to fill our homes, our lives, our souls with rare and beautiful treasures. Dear Friends, at the bottom of this page you will find a box where you can select your favorite style of music and I have also included one for my Church of Christ friends which features just vocal instruments--all the same song, Come Thou Fount of Every Blessing--because He is the Source of all things good. BTW, I took these pictures last fall, hence the leaves. The heat is unsufferable here in Arkansas--hope this will give us a little hope for fall and cooler temperatures. I have really struggled with this Blogger thing called Followers. I have had the gadget up, down, down, up but have chosen to leave it up for the past few months. The struggle?--oh, I don't know really--I just wanted people to be able to come over and read if and when they felt like it--didn't want anyone obligated to leave comments ever and I hope I have some readers who do just that. The other thing that bothered me was the name--Followers--I didn't want anyone to follow me. I read one blog writer who jokingly (but seriously) begged followers NOT to follow her. But, anyway, look what I found--the most wonderful group of friends in the whole wide world. I wouldn't trade any one of you for anything. I feel like I know most of you personally and some of you have become lifelong friends. I think when we lay our inner thoughts, emotions, beliefs, desires, and failures out in front of each other daily, we really do get to know one another. So, sweet, sweet friends please have a blessed day. I love you so. You are a treasure to me. Look what I found!! He longs for us to have treasures that moth and rust will not destroy, that cannot be stolen. He longs to be our treasure.